Dahab, which means “gold” in Arabic, was named after its glimmering sandy beaches that resemble gold dust. It lies 85 km north of Sharm El Sheikh and was originally a Bedouin village called Assalah. 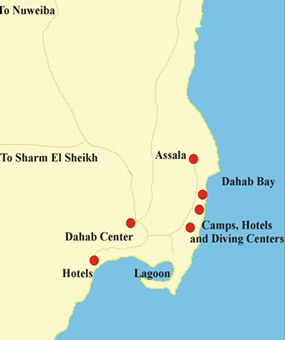 However, in recent years it has grown to become one of the main Red Sea Riviera resorts. 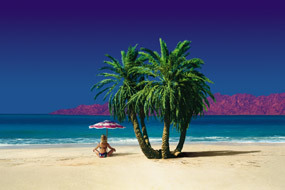 Visitors love to relax in its excellent restaurants and hotels or among the palm trees that surround its turquoise sea. Camel and jeep treks are favoured excursions and are normally led by a Bedouin guide. Easily reachable from Dahab are the breathtaking Colour Canyon, St Katherine’s Monastery and Mount Sinai. Part of the pleasure of such a day out is a genuine Bedouin meal at the Ein Umm Ahmed or Ein Kid oases. Dahab, like all other Red Sea Riviera resorts, has accommodation to meet every budget, from five, four and three star hotels to the very economical tourist camps located in the original Bedouin city of Assalah. A wide range of restaurants, discos, bars and nightclubs complete the picture in this small but lively resort, which also has a marvellous range of intriguing shops. 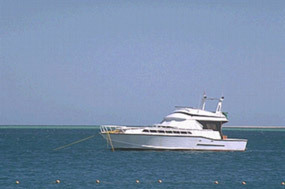 Among popular activities are diving, snorkelling and windsurfing. There are more than 40 dive clubs and most diving centres organise safaris to Abu Galum, the Nabq Protectorates and The Blue Hole (which is one of the best sites for experienced divers). Among the best spots for snorkelling are Lighthouse Reef, Eel Garden and the Canyon.